When Robert Hoddle laid out what became Melbourne's Central City area in 1837 he positioned its south-west corner next to Batman's Hill near the intersection of Flinders and Spencer Streets. The town's southern boundary (Flinders Street) ran approximately along the northern side of the Yarra River, but as the river did not flow exactly east-west, the central city block plan was tilted: northwards thoroughfares run north-west. Peripheral thoroughfares running true north, and the cross roads true east-west, were achieved by Hoddle running a line north for one mile from Batman's Hill, and from the point where it ended drawing a line east for two miles and west for one mile. The resulting line became Victoria Street and Victoria Parade. At the end of the two-mile long line (Victoria Parade) he drew a north-south line that became Hoddle Street and Punt Road. So began the typical metropolitan grid of cross roads, laid out as farm blocks were surveyed and main roads drawn in along their boundaries. Metropolitan Melbourne could scarcely be conceived of as such until after the influx of the goldfields population in the early 1850s. Central Melbourne was the primary township. Williamstown, surveyed in 1837, was the potential alternative port and seat of government, separated from Melbourne by Hobsons Bay, two rivers and the West Melbourne swamp. It was a satellite settlement, as were Warringal (Heidelberg, 1839), Sandridge (Port Melbourne, 1839) and St Kilda (1842). South Melbourne was a tent township for immigrants, but a formal township was surveyed in 1852. It was almost contiguous to Melbourne, and hence almost a metropolitan appendage, but the first true metropolitan settlements were North and West Melbourne, known as Parkside (1852) and Collingwood, which included Fitzroy. When a railway between Flinders Street, Melbourne, and Port Melbourne was opened in 1854 the latter arguably became linked in a metropolitan sense, but the railway was meant for freight more than commuters. Various outlying village sites had been reserved in the late 1830s, such as Braybrook, Pentridge (Coburg), Templestone, Warrigal and at locations on the Moonee Ponds Creek at what are now Pascoe Vale and Westmeadows. Many more examples of villages were surveyed in the 1850s, including Northcote, Hawthorn, Templestowe, Braybrook and Oakleigh (all 1852-53). Most of them lay beyond metropolitan Melbourne, some staying in that state for over 100 years in the cases of Westmeadows and Templestowe. Metropolitan Melbourne in the 1850s-60s was mainly confined to West and North Melbourne, Carlton, Collingwood, East Melbourne, South Melbourne and Port Melbourne. Mechanised transport links began with the Port Melbourne railway; and railway lines to Bendigo and Geelong (1859) included suburban lines to Footscray and Williamstown. Suburban lines to St Kilda, Hawthorn, Essendon and Brighton were opened during 1857-61. During the 1870s a suburban line was opened from South Yarra to Oakleigh, but it was during the next decade that lines to Coburg, Preston, Heidelberg and Box Hill were opened. That decade also coincided with the building of the cable tram network. During 1885-91 sixteen cable tram lines were opened, with a particular density in the inner northern suburbs; seven routes ran through Fitzroy and Collingwood. In 1878 the notion of Greater Melbourne was recorded in the annual Victorian Year Book. Greater Melbourne had 256,477 people, 29.51% of Victoria's population. The population figure is an exageration because Greater Melbourne was defined by a circle with a radius of ten miles from the city centre. Its area of 256 square miles was probably three-quarters rural. The following table summarises 'metropolitan Melbourne' over the last 30 years of the nineteenth century. Areas are defined by the names of local councils, and their dates of incorporation approximate their inclusion in Melbourne's urban growth. The data was obtained from contemporary Year Books and the Statistical Register (1901). 3 Split into Essendon borough and Flemington and Kensington borough in 1882, but populations of combined boroughs shown throughout this table. ** Originally incorporated as a shire. The depression of the 1890s caused a population decline in some places, and the figures had not fully recovered by 1901. During 1901-11 metropolitan Melbourne's population grew by nearly 100,000. The map below shows the local council areas, their populations and their population densities. Fitzroy's was the densest. Melbourne's is shown as less dense, but in reality North Melbourne (by then part of Melbourne council) had the densest population; Melbourne council's population density was diluted by public parks, industry, public buildings and the West Melbourne swamp. Port Melbourne's population was of middling density, but its housing was as crowded as Collingwood's; its western Fisherman's Bend area was almost uninhabited. The railway network was almost complete – a condition existing since the 1890s – although the outer circle through Camberwell is erroneously shown as a complete line. Electric trams were opened by local trusts in Kew, Hawthorn, Camberwell, Prahran, Caulfield and Malvern (1910-16), positioning those suburbs as middle class residential areas. The provision of good public transport to the eastern and south-eastern suburbs confirmed a trend that had been evident for 50 years as better-off Melburnites chose to reside there. The topography was undulating rather than flat, it was well away from miasmic West Melbourne swamps, separated by the Yarra River from the unhealthy although densely populated Collingwood and Richmond flats, and the rainfall bestowed better conditions for exotic gardens. Although industry stayed concentrated in Richmond and Collingwood, noxious industries expanded westwards to the Maribyrnong River in the 1880s. There were also sandier beaches along Port Phillip Bay's eastern shores which, combined with sea breezes, provided a salubrious coastal strip. The Yarra Valley stream system was also more pleasant than the western plains, and its alluvial pockets and stream valleys were relatively fertile and well watered. By 1947 the census showed that metropolitan Melbourne's population had, in 35 years, more than doubled to 1.23 million. The inner suburban population densities had little changed, Brunswick and St Kilda being the exceptions. The population densities of the next ring of suburbs had all grown. Camberwell's grew the most, and Coburg, Kew, Caulfield and Brighton also grew sharply. There was also a clear sign of the south-eastern reach of metropolitan Melbourne, following the railway lines to Frankston (1882) and Oakleigh-Gippsland (1879-88), and the south-eastern electric tram lines to Brighton and Carnegie (1925-37). There were also signs of growth along the Maroondah Road corridor through Box Hill to Ringwood. The great gap in metropolitan growth was in the north-east beyond Heidelberg. There were railway lines through Preston and Heidelberg, but Templestowe, encircled on the west and the south by watercourses and without any rail transport was to be an unurbanised space until the 1960s. Much the same applied in the south-east through to Mulgrave (Waverley), despite a railway to Glen Waverley having been opened in 1930. Although residential proximity to trains and trams continued to be important, motor car ownership enabled the settling of 'infill' suburbs like Doncaster, Vermont, Wheelers Hill and Dingley. The decision to place Victoria's second university at Clayton North in the late 1950s implicitly acknowledged the era of mass car ownership and the south-eastern spread of metropolitan Melbourne. Chadstone shopping centre (1960) did the same. The 1929 and 1954 metroplitan plans foresaw the need for freeways, and the West Gate Freeway and Western Ring Road follow lines drawn on maps in 1929. The 1954 plan presented an ambitious freeway blueprint and the 1969 Melbourne Transport Plan totted up a proposed 510 km of freeways. It partly reflected the 'great freeway building age' in California. It also threatened to strangle many inner suburbs, and in 1973 the State Government cut back the program in the face of the 'great freeway protest age'. Melbourne's first freeways were a short South Eastern freeway near Burnley and the Malty bypass at Werribee (1961). Bigger projects were the Tullamarine, West Gate, Mulgrave and Eastern Freeways (1970-77). Attention later turned to outlying ring roads (1990s) and tunnels. Costly tunnel works resulted in freeway tolls. Many freeway routes follow high power electricity easements and waterways. The concept of Greater Melbourne had been given formal expression in 1878 and during the next decade the concept of 'Marvellous Melbourne' was allowed to mask an inadequate metropolitan infrastructure, particularly in the area of public health. The Melbourne and Metropolitan Board of Works (MMBW) was established in 1890, with particular responsibility for water supply and sewerage. In 1929 a Metropolitan Town Planning Commission brought down its report on Melbourne's recommended metropolitan form, but economic depression and the 1939-45 war stopped metropolitan improvements, other than a few ventures into slum abolition. In 1949 the MMBW was made the metropolitan town planning authority in an area encircled in a 15 mile radius from the GPO, but extended to Ringwood, Dandenong and Frankston. In 1954 the MMBW published its report and planning scheme for metropolitan Melbourne, foreseeing district centres at Footscray, Preston, Box Hill, Moorabbin and Dandenong. It also foresaw a system of arterial roads that was a template for future freeways. In its planning policies for metropolitan Melbourne in 1971 the MMBW proposed urban corridors in the directions of Werribee, Melton, Sunbury, Craigieburn and Whittlesea (Plenty corridor). It also sketched in the Berwick/Cranbourne corridor, which became probably the most vigorous of the late twentieth century growth areas. The following table shows population growth areas by local council areas during 1961-91. Councils created during 1961-91 have their dates of proclamation in parentheses. ** Early postwar suburbs: 1954 census figures were Moorabbin, 65,332; Nunawading, 23,855; Sunshine, 41,332. There was a noticeable population decline in early/middle postwar areas such as Moorabbin and Waverley in the 1980-90s. The outer suburban councils continued growing into the twenty-first century, although they were amalgamated, mostly with new names, in 1993-94. They are printed in bold font in the above table. In the period 2006-11 there was a lot of growth in western suburban Melton and Wyndham. The MMBW planning scheme (1954) foresaw that development should be concentrated around district centres such as Footscray, Box Hill and Dandenong, all based around public transport nodes. Urban sprawl was not particularly worrying at that time, and the interwar standard house block of 50 x 150 feet was the accepted norm. (Often described as the quarter acre block - it was actually one sixth - the dimensions could go up to 60 x 160 feet.) The standard applied whether in upmarket North Balwyn or in State housing estates in West Heidelberg or Broadmeadows. By 1970 urban residential sprawl was well to the fore. Future growth could go out along public transport corridors or by infilling between the corridors and creating an even more car-dependent metropolis. Planning opted for keeping to the transport corridors and designating the potential infill areas as green wedges, ie keeping them as rural conservation, market garden or public open space areas. Already, however, there had been instances of development gobbling up potential open space. Classic early examples had been drive-in shopping centres: whilst developers preferred cheap land away from a commercial centre, usually land of sufficient acreage for a drive-in centre was not to be found in existing centres. Some car-dependent residential centres also got away from planners: Vermont South was developed in the 1970-80s in orchard country, with no railway and 7 km east of a tram terminus. The tram service was finally extended to it in 2005. In 2002 the Melbourne 2030 plan was released. It repeated the 1954 concentration on existing activity centres, the 1971 preference for green wedges and the continuation of higher density housing ('the compact city policy'). Density was achieved by dual occupancy, eg putting a second house on the suburban back lawn, smaller house lots, row houses, apartments and recycling of industrial land for residential living. Activity centres were graded by several levels of size in Melbourne 2030. 'Principal activity centres' were divided between about two-thirds around rail transport, eg Box Hill, and one-third other, eg Chadstone. Higher density housing came in for sustained public criticism, particularly in higher value tree-lined suburbs such as Balwyn and Camberwell. There was a trenchant campaign to stop a high-rise mixed development in Burke Road, Camberwell, overlooking the railway station. The proposed development stalemated. Shortly afterwards the Government called in a development for a multi-storey tower 1 km down Burke Road at the Camberwell junction. Soon called the 'green latrine', the tower nevertheless went ahead while the railway station land stood idle. It was one in the eye for eastern suburbs better-planning advocates. The demand for detached houses was unabated, as couples had children and moved out to Point Cook or Pakenham. Green wedges came under increasing pressure for land subdivision, notably in Heatherton where market gardens are the hole in a doughnut of south-eastern housing. Since about 2002 when Melbourne 2030 was launched, a standard dwelling-and-land package became increasingly unaffordable for aspiring homeowners. The solutions to housing costs were migration to peri-urban sites, outside the plan's urban growth boundary, small-house packages, or apartments. However, most apartments were 70 sq metres or less, and small houses on a block half the size of the once standard 50 x 150 feet fell short of many families' expectations. Most small-house packages were on the urban fringes. In 2010 the Government approved extra land releases totalling 41,600 hectares on the urban fringe, a supply-side initiative that might stabilise or lower prices for house lots. Migration to peri-urban centres had been under way for several years, usually to places such as Wallan or Garfield on rural trunk railway lines. The trade-off for longer travel is that in those places an affordable house purchase comes with twice as much land as a house on the urban growth boundary. * These figures obtained from Victorian Year Book 1973, and they differ from contemporary totals in the previous table for 1871-1901. 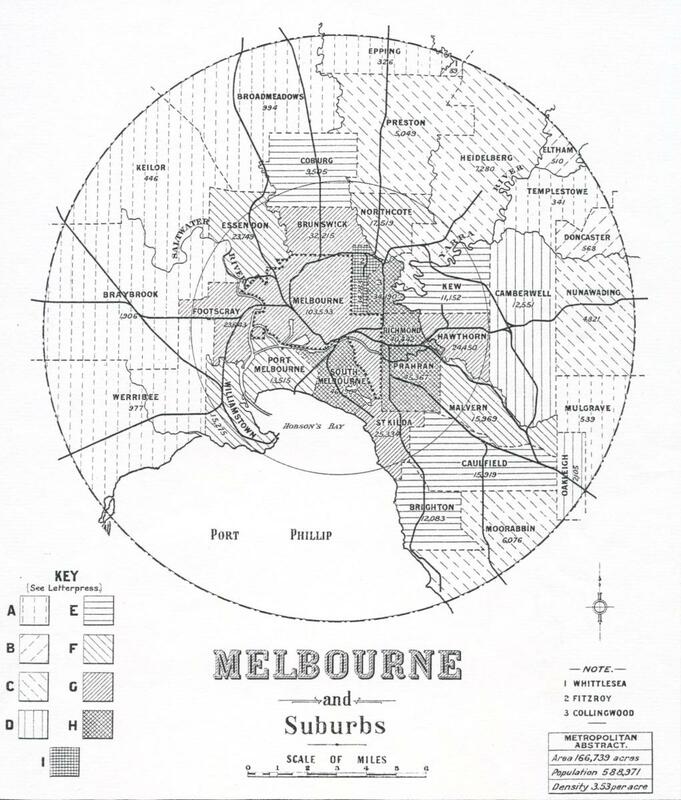 ** Greater or metropolitan Melbourne was defined by a circle of 10 miles radius until 1920. The entry for Victoria has data on manufacturing and employment.